Imagery date refers to Google Earth capture of land forms. Ice extent is for August 31, 2016 from MASIE. Serenity is docked at Devon Island. Click to zoom in. This article demonstrates the use of historical instrument and descriptive records to assess the hypothesis that environmental conditions observed by 19th-century explorers in the Canadian archipelago were consistent with a Little Ice Age as evident in proxy records. We find little evidence for extreme cold conditions. It is clear that the first-hand observations of 19th-century explorers are not consistent with the hypothesized severe conditions of a multi-decadal Little Ice Age. Explorers encountered both warm and cool seasons, and generally typical ice conditions, in comparison to 20th-century norms. There were more than seventy expeditions or scientific enterprises of various types dispatched to the Canadian Arctic in the period between 1818 and 1910. From this number, we analyzed 44 original scientific reports and related narratives; many from expeditions spanning several years. 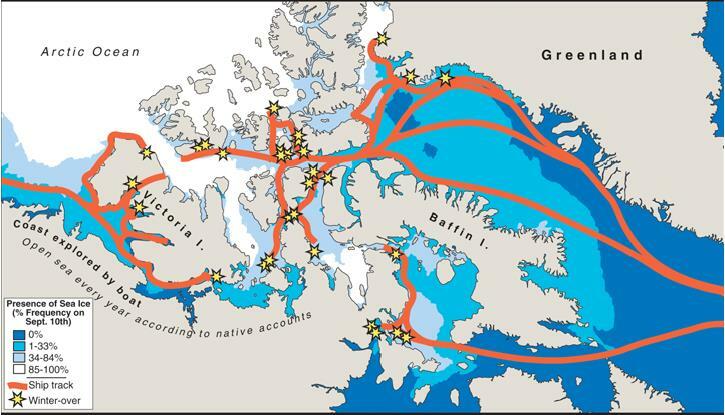 The majority of the data come from large naval expeditions that wintered over in the Arctic and had the capacity to support an intensive scientific effort. A table listing the expeditions and data types is located at http://www.pmel.noaa.gov/arctic/history. The data cover about one-third of the possible number of years depending on data type, and every decade is represented. Our analysis focuses on four indicators of climatic change: summer sea ice extent, annual sea ice thickness, monthly mean temperature, and the onset of melt and freeze as estimated from daily mean temperature. 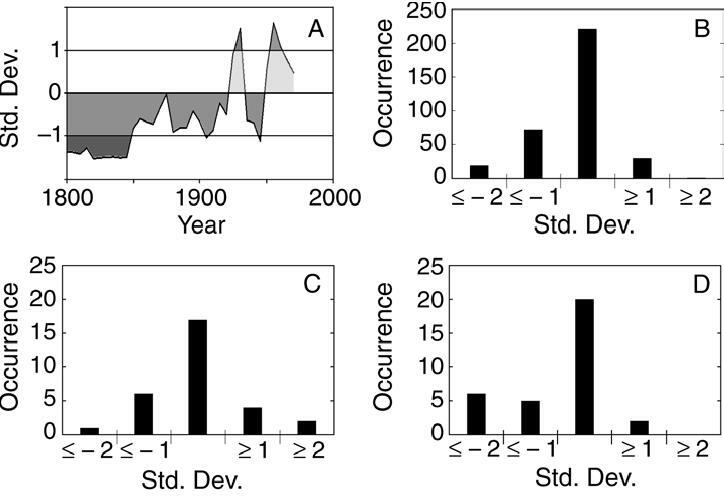 Historical observations in these four categories were compared with modern reference data; the reference period varied, depending on data availability. Both sea ice extent and the onset of melt and freeze were compared to the 30- year reference period 1971–2000; monthly means are compared to the 50-year period 1951–2000. Modern sea ice thickness records are less continuous, and some terminate in the 1980s; the reference period is therefore based on 19 to 26 years of homogeneous record. (a) Proxy record of standardized summer air temperature variation derived from ice cores taken on Devon Island. This proxy record suggests that a significantly colder climate prevailed in the 19th century. Shading indicates temperatures one standard deviation warmer or colder than average for the reference period 1901–1960 [Overpeck,1998]. (b) Historical monthly mean temperature observations compared to the 20th-century reference period 1951–2000. Sixty-three percent of 343 monthly mean temperatures recorded on 19th-century expeditions between 1819 and 1854 fall within one standard deviation of the reference mean at nearby stations (reference data from Meteorological Service of Canada,2002; and National Climatic Data Center,2002). (c) Onset of melt observed by expeditions between 1820 and 1906 expressed as departures from the mean for the reference period 1971–2000. The period of melt transition observed by 19th century explorers is not inconsistent with modern values. (d) Onset of freeze observed between 1819 and 1905 compared to the reference period 1971–2000. The onset of freeze transition is frequently consistent with modern values,but in some cases occurred earlier than usual. The incidence of an early onset of freeze represents the largest departure from present conditions evident in the historical records examined in this study. Melt and freeze transition dates for the reference period 1971–2000 were calculated from temperature data extracted from the Global Daily Climatology Network data base (National Climate Data Center, 2002). Fig.2. The ship tracks and winter-over locations of Arctic discovery expeditions from 1818 to 1859 are surprisingly consistent with present sea ice climatology (contours represented by shades of blue). The climatology shown reflects percent frequency of sea ice presence on 10 September which is the usual date of annual ice minimum for the reference period 1971–2000 (Canadian Ice Service,2002). On a number of occasions,expeditions came within 150 km of completing the Northwest Passage, but even in years with unfavorable ice conditions, most ships were still able to reach comparatively advanced positions within the Canadian archipelago. By 1859, all possible routes comprising the Northwest Passage had been discovered. As stated here before, Arctic ice is part of a self-oscillating system with extents expanding and retreating according to processes internal to the ocean-ice-atmosphere components. We don’t know exactly why 19th century ice extent was less than previously or less than the 1970s, but we can be sure it wasn’t due to fossil fuel emissions. Explorers encountered both favorable and unfavorable ice conditions. 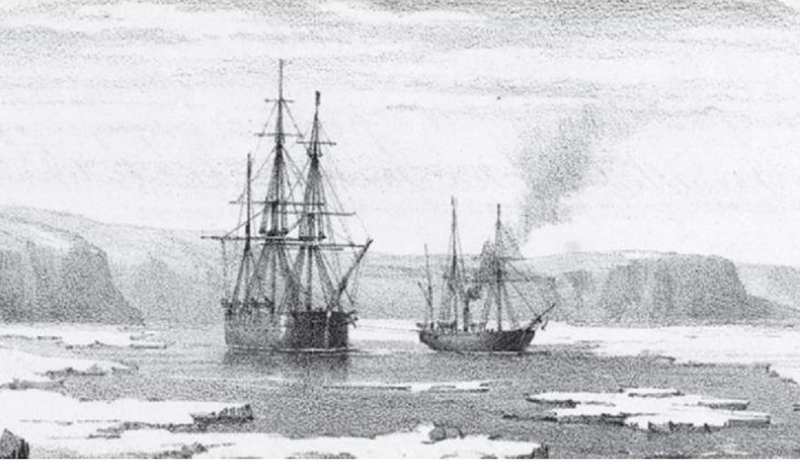 This drawing from the vicinity of Beechey Island illustrates the situation of the H.M.S.Resolute and the steam-tender Pioneer on 5 September 1850 [from Facsimile of the Illustrated Arctic News,courtesy of Elmer E.Rasmuson Library,Univ.of AlaskaFairbanks]. towards the end of that page, there is a map with the sea ice extent from 1769 which was not that different from today. Yes, Vinje’s analysis pertains to the European side, and this one covers the Canadian side of the Arctic. The results of both show ice extents wax and wane over quasi-60 years cycles. Thank you for your look into historic Arctic climate conditions. I love this sort of stuff, Ron. Partly because it debunks a lot of the Alarmist talk about how sea-ice is at all-time lows, but also because the sailors back then were so gutsy and endured stuff that really is amazing. If you ever want to read about a government funded operation that really went bad, read about the attempt of the Polaris to get to the North Pole in 1871. Apparently they got into the alcohol which was suppose to be used to preserve scientific specimens and discipline went downhill. The captain was murdered and the ship eventually sank. Before it sank around half the crew and the Eskimo guides got marooned on an ice floe and the ship didn’t bother pick them up. The guys on the ice floe then drifted over 1800 miles, from Nares Strait up at the very top of Baffin Bay down to where they were rescued off the coast of Newfoundland. I mean April 1873, of course. Thanks Caleb for that lore. By correcting for 1873, you are ruling out a superhuman feat of survival. I didn’t realize there were so many in the past decade. Satellite imagery helps a lot, but some get stranded for a winter, or helped by icebreakers. Getting stuck up there for a winter was really rough back in the old days. Of course the men on the Franklin all were lost, perhaps due to lead in their tinned food making them crazy, but other ships did far better. It all seemed to depend on the captain keeping control. On one ship they passed the time by publishing a newspaper for awhile. There’s the nod to climate change, but only one sentence at the end. Mostly a recounting of the journey 230 years ago in canoes.